DNS translates hostnames (such as www.goldenfrog.com) into a computer readable IP address (216.196.118.239) so your computer can communicate with the desired host. Internet users typically rely on their ISP's DNS servers or a 3rd-party DNS, which are often configured to comprehensively log your Internet activity and censor websites - even if you use a VPN. VyprDNS is Golden Frog's 100% owned and operated DNS service available exclusively for VyprVPN users. We developed our zero-knowledge VyprDNS service to increase user privacy and defeat censorship across the world. VyprDNS is built into VyprVPN and when you connect, you will automatically use VyprDNS. Please note, VyprDNS cannot be used separately from VyprVPN. Unfortunately Internet censorship is increasing across the world. Repressive government regimes unleash DNS "man in the middle" attacks to censor websites or Internet services. Private organizations also filter DNS requests to block portions of the Internet. VyprDNS is Golden Frog's response to defeat DNS censorship and promote online freedom. DNS man-in-the-middle attacks can occur when a government or 3rd party redirects you to a different online destination than you were trying to reach. For example, governments in China, Iran and Turkey can intercept your DNS request when you attempt to visit www.facebook.com and redirect you to an error page. Coffee shops, airports and other public Wi-Fi hotspots frequently configure their DNS servers to deny access to specific types of websites. Using VyprVPN with VyprDNS, your data and DNS requests pass through an encrypted tunnel that defeats "man-in-the-middle" DNS attacks and prevents DNS filtering so you can experience an open Internet. Most 3rd-Party DNS servers log a and can keep a perfect record of when and where you go online. For example, Google DNS logs IP address, websites visited, geolocation data and much more. VyprDNS is a zero-knowledge DNS so Golden Frog never retains hostnames, including hostnames found in URLs. VPN providers using 3rd-Party DNS servers expose their users to monitoring, logging and manipulation. We run our own DNS servers so our VyprVPN users DNS requests are not placed in jeopardy of being monitored, logged or manipulated. Most VPN providers don't offer their own DNS servers, and users' DNS requests are sent over 3rd-party networks to 3rd-Party DNS servers. As soon as the DNS query leaves the VPN server, it has the potential to be monitored, logged and manipulated. Since VyprDNS receives DNS requests over the Golden Frog network, requests can not be monitored, logged or manipulated by 3rd parties. Because most VPN providers don't run their own DNS, they rely on 3rd-party DNS servers that are often located in a different country than the VPN server you connect to. This causes websites you visit to return results optimized for the location of the DNS server and not your VPN server location. Golden Frog prevents these geo-location errors by including VyprDNS at the same location as the VyprVPN server you connect to so you receive the proper online experience for that country. DNS Logs None - VyprDNS is a zero-knowledge DNS so Golden Frog never retains hostnames, including hostnames found in URLs. Significant - IP address, websites visited, geolocation data, and much more. DNS Censorship: "Man-in-middle-attacks" Defeated - Your data passes through an encrypted tunnel so they cannot be examined or intercepted. Prevalent - Oppressive government regimes can intercept your unencrypted DNS requests and block access to websites. DNS Censorship: Filtering None - We strongly believe in a free and open internet. Our VyprDNS service does not restrict access to websites or hosts. Frequent - Many 3rd-party DNS servers are configured to block specific websites. DNS Location Errors Greatly Reduced - VyprDNS is at the same location as the VyprVPN server you connect to so you receive the proper online experience for that country. Frequent - DNS servers are frequently located in a different country than the VPN server you connect to. Ads & Injected Content None - Because VyprDNS is a zero-knowledge DNS, VyprDNS doesn't inject ads into your DNS requests and doesn't manipulate the content of the websites you visit. Common - Mistyped URLs redirect to pages with ads. The content on the website you want to visit can be replaced with content from a 3rd party. DNS Logs None - VyprDNS is a zero-knowledge DNS so Golden Frog never retains hostnames, including hostnames found in URLs. DNS Censorship: "Man-in-middle-attacks" Defeated - Your data passes through an encrypted tunnel so they cannot be examined or intercepted. DNS Censorship: Filtering None - We strongly believe in a free and open internet. Our VyprDNS service does not restrict access to websites or hosts. DNS Location Errors Greatly Reduced - VyprDNS is at the same location as the VyprVPN server you connect to so you receive the proper online experience for that country. Ads & Injected Content None - Because VyprDNS is a zero-knowledge DNS, VyprDNS doesn't inject ads into your DNS requests and doesn't manipulate the content of the websites you visit. DNS Logs Significant - IP address, websites visited, geolocation data, and much more. DNS Censorship: "Man-in-middle-attacks" Prevalent - Oppressive government regimes can intercept your unencrypted DNS requests and block access to websites. DNS Censorship: Filtering Frequent - Many 3rd party DNS servers are configured to block specific websites. DNS Location Errors Frequent - DNS servers are frequently located in a different country than the VPN server you connect to. Ads & Injected Content Common - Mistyped URLs redirect to pages with ads. The content on the website you want to visit can be replaced with content from a 3rd party. 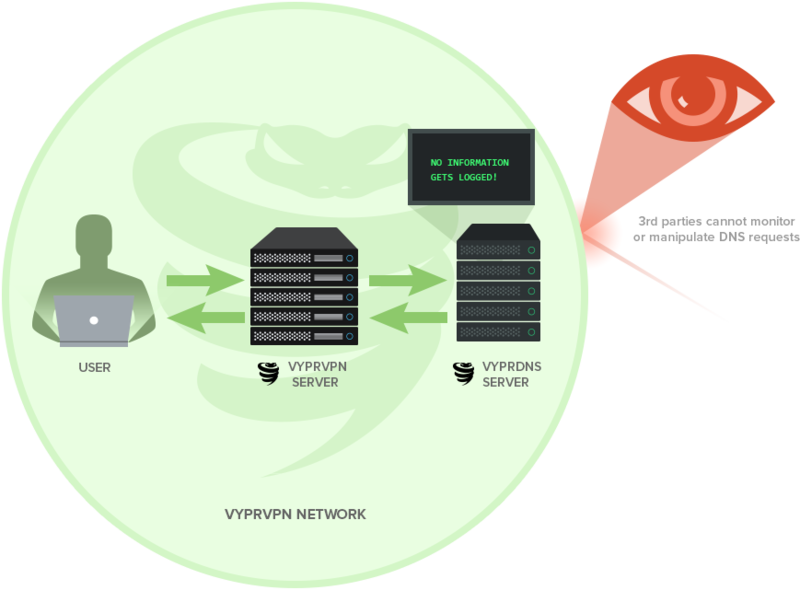 *VyprDNS is built into VyprVPN service and when you connect to VyprVPN, you will automatically use VyprDNS. Please note, VyprDNS cannot be used separately from VyprVPN.